One of the joys of living in Midtown is having easy access to some of the best restaurants in Memphis. Although many of them are located in trendy Cooper-Young, there are places all over Midtown where a person can get a good meal. In my neighborhood of Vollintine-Evergreen, there is a great restaurant that is very close to home, which is Dino's Grill. Dino's has been around for as long as I can remember (since 1973 in that location). Although I didn't dine there often as I was growing up, I have since made up for lost time. Recently, I have tried several items off the menu, and just about everything I had was really good. The Fettuccini Alfredo is some of the best I've ever had in Memphis. 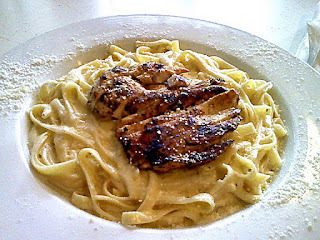 The Alfredo sauce is thick and creamy and not watery, unlike a lot of places that serve it. However it is a bit salty, maybe due to the fact that the entrée comes topped with a lot of grated Parmesan cheese which tends to be very high in sodium/salt. When I ordered it, I had grilled chicken added to it (shrimp is also an option) which made it a HUGE meal. It came out in a large plate with garlic bread, and the meal more than satisfied my appetite. With the entrée being so huge, there is no need for an appetizer, for it will probably cause most people to go into fullness overload. (I made that mistake when I had chicken noodle soup earlier in the day). Getting back to the sauce, it seems that genuine Italian restaurants are the only ones that make thick cream sauces, while other places (particularly chain restaurants) can't seen to get it right, in my opinion. Anyway, the Fettuccini Alfredo at Dino's is great stuff. 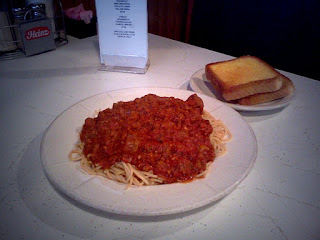 Another pasta dish that I had was the spaghetti with garlic bread, one of the daily lunch specials offered by Dino's. The entrée consists of a plate of marinara sauce (or as the owner calls it, "gravy") over spaghetti with two slices of extremely buttered garlic bread. Speaking of garlic, the marinara sauce is heavily seasoned with it, for I was able to detect it on my first bite. The marinara sauce also had chunks of celery, something I don't normally encounter but it bolstered the sauce in terms of taste and body. Unfortunately, the sauce was watery which made stirring it tricky. In mixing the sauce into the pasta, some of it splattered on my shirt (not a big deal since I was wearing something that was expendable). Once I mixed the sauce and pasta together and sprinkled Parmesan cheese on it, the spaghetti dish turned out to be decent. Even though I liked the spaghetti, I would rate it a "3" on a five-point scale on the basis that the sauce was too watery. However, with the meal being the Tuesday lunch special that cost $5.64 (not including tip), I can't complain too much. I can't see one of my favorite restaurants for pasta, Bardog Tavern, selling their spaghetti at Dino's price. For the lunch special price, the spaghetti and garlic bread is a good meal that I'll be eating again (with a bib). If I go on Thursday nights, I can take advantage of Dino's all-you-can-eat spaghetti special that cost $7.49. The way I like to get my grub on, that's a great incentive to return. 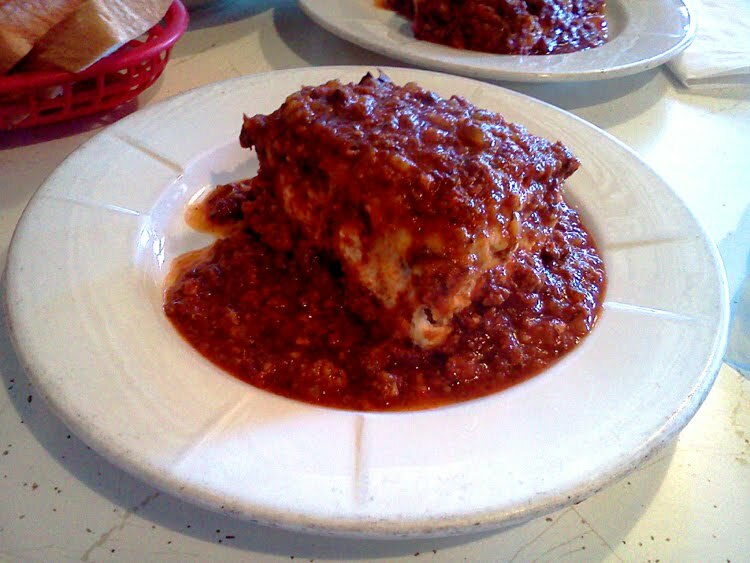 By far, my favorite pasta dish is the lasagna. I like it because it is very meaty with layers of ground beef and just the right amount of cheese to keep it all together. Speaking of cheese, there is enough Mozzarella in it to satisfy lasagna lovers and pasta purists. The sauce used in the homemade lasagna is the same marinara sauce that is used in the spaghetti, so the garlic was present as well. As I said, Dino's lasagna is the best pasta entrée on its menu and possibly the best lasagna in Memphis. Of course, this is just my opinion, and those partial to places like the numerous other Grisanti restaurants in town might disagree. However, I don't believe anyone could have the lasagna and not be impressed with it. In order for this to be a complete review, I tried a couple of grilled items from the menu. After all, it wouldn't make sense not doing it, given that "Grill" is a part of the restaurant's name. The first item I had was the cheeseburger, featuring a ⅓ lb. beef patty with lettuce, tomatoes, pickles and onions on a toasted bun. When I placed my order for the burger, I told my server that wanted the 1/3 lb. hamburger with the Angus beef patty and cheese, and even though I got a burger with a thick piece of meat, I'm not sure it was what I ordered. 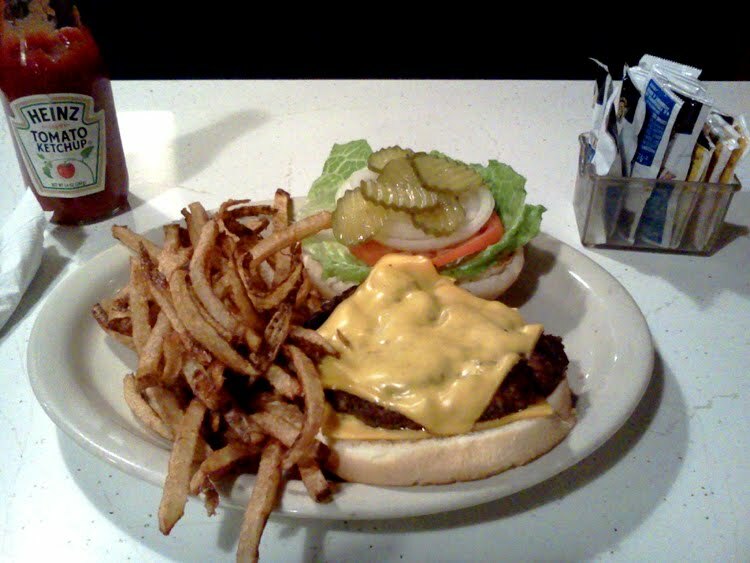 The burger, despite having two slices of American cheese, was average in terms of quality, including the beef patty. For what I paid for it ($3.19), it was decent, but not exactly the best in the neighborhood. (For that, I recommend Alex's Tavern and Cafe Eclectic, which is a block away from Dino's on McLean Boulevard). The other grilled item that I had was the Italian Steak Sandwich. The sandwich consists of strips of steak grilled with green peppers and onions and seasoned in spices that I couldn't identify. In terms of taste, the sandwich didn't measure higher than a "meh" on my satisfaction scale. In eating it, I had to go open-face with it because the bun-to-meat ratio was higher than I'm accustomed to. In addition to removing the top bun, I also scraped off the grilled onions because the spices that it was marinated in didn't suit my tastes. Once I finally got to eat the sandwich, I found that the steak strips were "dry" as it relates to oiliness/greasiness, and the green peppers didn't help. 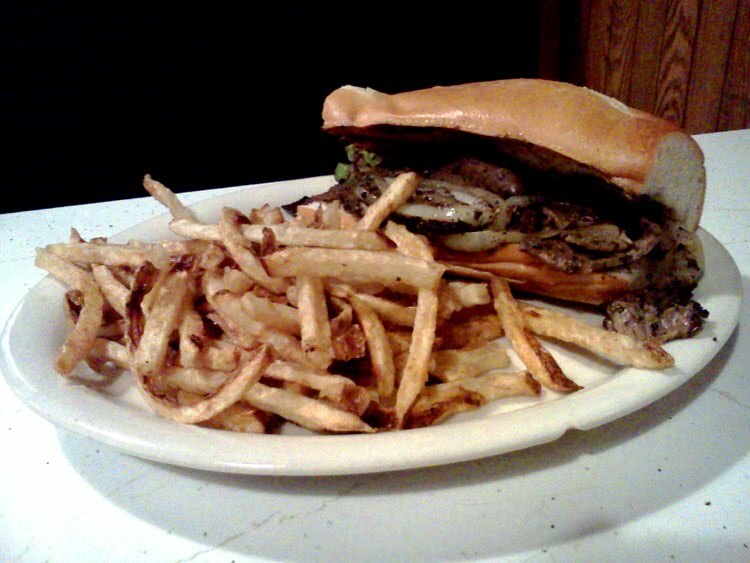 In all, I feel that the Italian Steak Sandwich is somewhat decent. However, if I hungered for something like this again, I'm going to either Subway or Lenny's for a meatier, tastier sandwich. 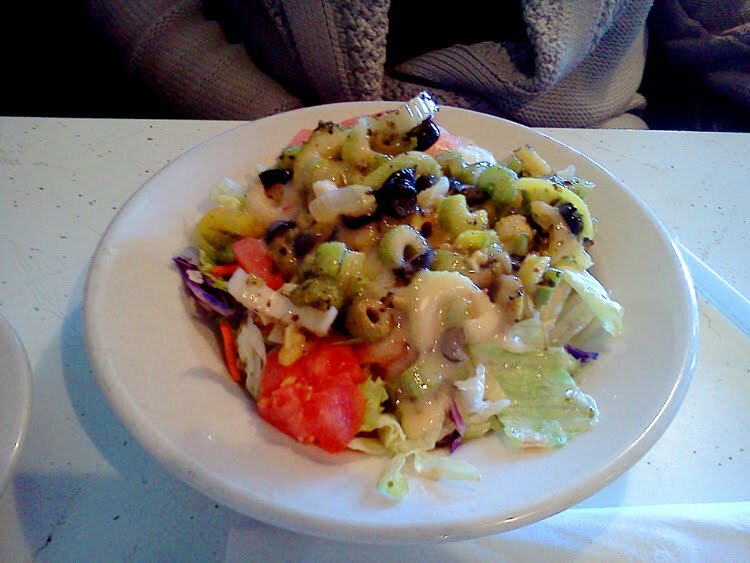 For vegans and vegetarians, Dino's offers a nice selection of salads that are good enough to be the main course of a meal. An example of this is the Italian salad, consisting of numerous vegetables including banana peppers, celery, black and green olives, onions and tomatoes. The salad is topped with a vinaigrette made up of vinegar, Italian dressing and "oil" (probably olive oil) that was thick and creamy. All combined, the salad tasted great and makes for a fine meal by itself. The amount of salad that comes with this is huge, so much so that it shouldn't be considered an appetizer. Therefore, for vegans/vegetarians and other health conscious people, consider Dino's as an option when looking for a place to dine. 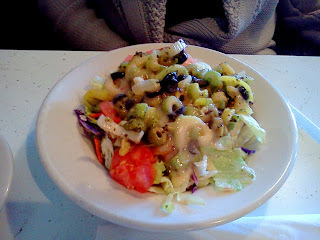 By the way, Dino's offers a grilled chicken salad for carnivores, which I'm confident is great. Dino's also serves breakfast from 7 AM to 11 AM. The breakfast menu is pretty basic, similar to what is served at Barksdale Restaurant, but is really good. It mostly consists of egg dishes that can be cooked to order, including omelets. My favorite is the Western Omelet, which Dino's makes with American cheese, ham, tomato, red and green peppers, onions and possibly specks of black pepper. The flavor of the omelet is highlighted by the sautéed peppers and the saltiness of the cheese, which combined makes for a wonderful taste. Add in the home fries and sausage and you have the makings of a great breakfast. The home fries aren't normally an option, but Dino's was out of hash browns and I wasn't in the mood for grits, so I opted for the fries. I'm glad I did, for the thin potato wafers, hand cut and fried to a golden brown, was the perfect breakfast complement. The home fries, despite being fried, aren't crispy and the texture is similar to au gratin potatoes. 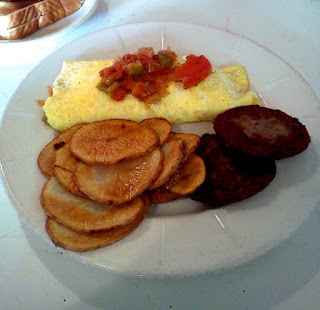 From an eating perspective, it's easier to stick a fork in a home fry than a hash brown, so forking it with the omelet and sausage made it an easy pleasure to enjoy. Even though Dino's doesn't have the extensive breakfast menu that nearby Cafe Eclectic has, it is still a great place to go for a good and hearty morning meal. For those looking for something different, I would suggest the 3-Way Tamales. It consists of tamales topped with spaghetti, chili, cheddar cheese and diced onions, which combined makes for a huge meal. 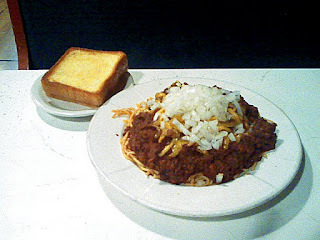 The chili, the main component of the entrée, is very meaty and spicy that dominates the plate. There is so much of it that one could assume that they are eating a plate of chili with spaghetti, only to notice the tamales later. The tamales are buried at the bottom of the plate and are more of a support element to the chili, instead of the other way around. Compared to a similar tamale I had at Ugly Juanita's last month, the 3-Way's chili wasn't as flavorful. Fortunately, the diced onions made up for that, giving the 3-Way a boost in taste. Because of enormity of the meal, I couldn't finish it and took home the leftovers. The next day, while I ate the rest of it with some seasoned chicken wings, I noticed a slight difference in taste. It seemed that the aroma of the onions permeated through the rest of the 3-Way which resulted in a sour sweet taste. That surprised me in a good way, for I'm not a big fan of onions that aren't sautéed. In all, the 3-Way Tamales (which aren't listed on the printed menu) is a great meal that impressed me a lot. To sum it up, just about everything I had at Dino's was excellent. I must admit that I wasn't too impressed with the grilled items that I had, but I don't think it's a big deal. Given that it is an Italian restaurant, most diners (at least the ones I saw) go there for the pasta. The pasta that Dino's dishes out is on par with a lot of great Italian restaurants that I've visited in America and Italy. Because it is a neighborhood restaurant that caters to families, Dino's may not appeal to some of the people that I roll with. Although it isn't flashy like Andrew Michael Italian Kitchen or as popular as Pete & Sam's, it is a restaurant worthy of least one visit by anyone who loves Italian food. I am fortunate that it is in my neighborhood, for Dino's Grill makes it a better place to live.